This lovely melody makes a very nice instrumental or vocal solo, and the words pull at the heartstrings. As when the voice-over at the end of Braveheart says "they fought like warrior-poets", this is a song about a warrior, a soldier, a harper. 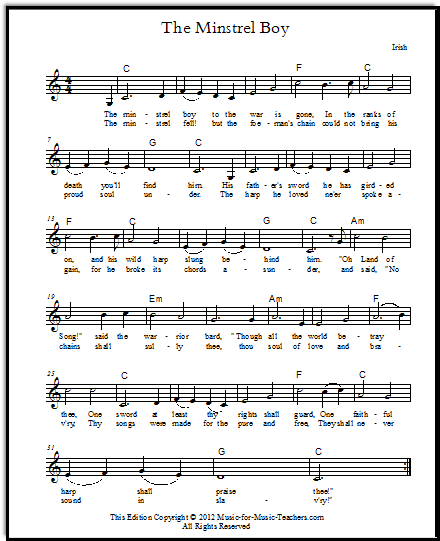 I love the words the minstrel says to his harp, "Thy songs were made for the pure and free - they shall never sound in slavery!" Then he breaks the strings rather than allow the enemy to capture it whole. The love of country, and especially the heroism of men embodied in this song, remind me of other Irish songs. Actually, an awful lot of Irish songs do seem to be about battles for freedom, and DEFEAT. This song is about the faithfulness of a young man, a bard, a warrior-poet, with the final words sung to his harp. 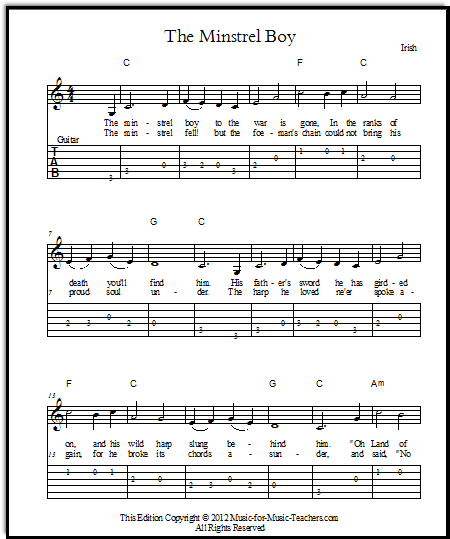 Fingerpicking is particularly beautiful and well-suited to this free Irish sheet music. The key of D is easier for young guitarists, perhaps, unless they have mastered the F chord (to go with the key of C), but even the Bm and F#m chords in the key of D are not difficult with practice, and with Irish music you are going to end up using the Bm chord pretty early on, so get with it! If your student wishes to flat-pick the melody in D, this is a good opportunity to explain "2nd position" to him. That is, using finger 1 in fret 2, finger 2 in fret 3, etc. 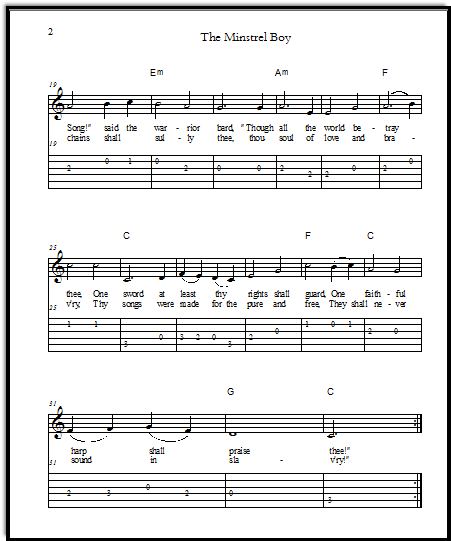 And here are lead sheets for The Minstrel Boy, in seven keys. 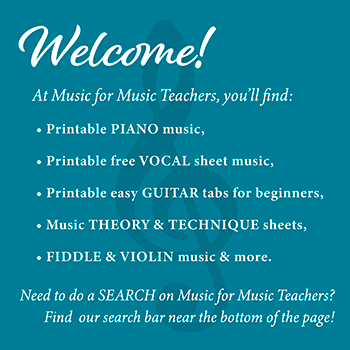 If you are interested in a fleshed-out piano accompaniment, go to this page where there is a beautiful piano arrangement. Listen to this bagpiper! He's great! Music has such power to move the heart... do you have a story or a question about this music? Do you have a picture to add? Click the button and find it on your computer. Then select it.